There are few trainers out there like Les Bridge and few with one-liners like those he produced after promising mare Seasons strolled to her first Saturday win at Rosehill. 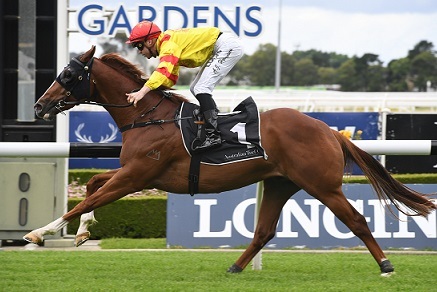 Seasons, the $1.70 favourite, was untroubled in winning the Australian Turf Club Sprint (1200m) at her first run since June and it was enough to send Bridge to the fence for a close up of her coasting home over the last 200m. "I did get excited, I haven’t been this excited since Souths won the grand final,'' Bridge quipped. Bridge has been in charge of many talented mares, racehorses in general, over the years including superstar Hot Danish but he's not one to compare. He's also not a big long term planner, saying we'll see Seasons another once or twice this campaign before she's given her chance in better company in 2019. "I’ll give her a couple of runs, I’m an old ad lib bloke,'' he said. Jockey Tim Clark, who was Hot Danish's regular rider, said it's obvious Seasons has her share of talent but believes we won't see the very best of her for a while yet. "She showed her class, she wandered a bit when she was out in front by herself but she’s got plenty of upside,'' he said. Surprisingly, Seasons didn't clock the fastest sectional for any 200m split in the race but ran her last 600m in 33.44 according to Punters Intel. Trainer Joe Pride would love to see more competition in staying races but was more than happy for Tamarack’s connections to pocket $58,000 for little more than a breeze around Rosehill. Trainer Joe Pride (Pic: Bradley Photos). Only four horses contested the Summer Racing Handicap (2400m) after the field was cut in half by scratchings and Pride all but dared other trainers to have a crack. “It’s not exactly inspiring racing seeing a four horse field but for the connections it’s a real boost and it’s a win the horse deserves,’’ he said. Tamarack, $2 favourite, followed the rank outsider Casiraghi, whose connections pocketed $6500 for turning up, and had a superior turn of foot as he raced away to a 3-1/4 length win. A win that Pride said it was hard not to expect. “It was nice for that horse to lead us, it gave us a bunny to chase, I thought he raced honestly and there’s more wins in store,’’ he said. Given his next start will be in a Benchmark 78, Tamarack (who had a 76 rating going into the race) will face a hefty weight rise but another win could see him tackle the Christmas Cup. The defeat of odds-on favourite Roheryn overshadowed a very tidy return by stakes winning colt Chess Star. Chess Star led all the way to win the 2019 Membership Handicap (1100m), sprinting home in 33.31, holding over two lengths on the late charging Roheryn. “He had to do it at both ends, going into this race he put the writing on the wall in open company so we were pretty happy with him,’’ Bott said. Chess Star (Adam Hyeronimus) wins at Rosehill. (Pic: Steve Hart). Co-trainer Adrian Bott said the stable was always confident Chess Star would perform well first-up after he ran a close second to Redzel in a barrier trial on October 30. Bott said Chess Star would likely be set for the Magic Millions Guineas (1400m) in January but will likely continue his preparation in Sydney. Jockey Adam Hyeronimus said he knew midrace when he was able to steal an 11.22 section that he’d take plenty of running down. “I said to Adrian before the race the favourite would want to be good taking us on and would, have to be on his game to give us a run for our money,’’ Hyeronimus said. Trainer Kim Waugh was narrowly denied a winning double when favourite Newsfan was touched out by Sweet Deal in the final event at Rosehill but she was lucky to have runners at the meeting at all. An accident on the M1 forced the late scratching of five horses - Muswellbrook based Iamacrumpet and Alliterate and the Kris Lees trio of Sense Of Occasion, Just Dreaming and Articus - due to heavy delays on the freeway. But Wyong based Waugh was able to make the trip as the accident occurred just prior to her entry point to the M1 and she celebrated a win with Our Century in the November Topaz (1900m). Punters expected Newsfan to complete the training double but, according to jockey Sam Weatherley, a mix of the 59kg and an average tempo conspired to bring her undone. "They went slow and sprinted off the corner, with the big weight she wasn't able to sprint with them,'' Weatherley said. If you wondered why Tommy Berry took particular joy in guiding Firsthand to his first win in 13 months it’s because the gelding is part-owned by his wife Sharnee. Berry gave a noticeable fist pump as Firsthand took out the November Handicap (1400m) going one better than a year earlier when runner-up to Cabeza De Vaca. “It was very special. I am the key,’’ Berry joked afterward. “We always thought he was a stakes class horse but he has to do everything right to get that level. Firsthand tracked the leaders into the straight and it took a while for Berry to force his way clear but when he did he impressed the popular hoop with his turn of foot. Berry rode Firsthand to his maiden win on debut in February 2016 and Saturday was his first win on the horse since.